Arrow continues with the thread of Robert Queen’s actions becoming an issue that Oliver has to deal with in the present day when someone comes after him because of something his father did. For someone who has been dead for around 12 years Robert Queen still makes a significant impact on the lives of those around him. Oliver in particular has slowly been realising that his father really wasn’t a good person and as the eldest surviving member of the Queen family he has to deal with the fallout. A consistent theme in Arrow is that nothing in your past stays buried. The show employed deeply connected flashback storytelling for five years to prove that point and it still lingers in this post flashback world. The thing that Oliver has to deal with this week is something he directly witnessed. Robert killed both his bodyguard and himself to give Oliver a fighting chance at survival. It turns out that the bodyguard had a son who is looking for revenge for the death of his father. The line “people without the last name Queen are Human beings too” is particularly poignant as it makes Oliver consider the fact that he ignored the range of consequences of Robert’s actions on that fateful day. It’s particularly effective as the nature of television makes it easy to forget that there is a whole person behind behind the man that Robert shot. From an audience point of view he was unimportant as this is Oliver’s story but this episode drives at the idea that there are stories everywhere and they should be considered before taking action. Even though it was Robert that pulled the trigger Oliver isn’t blameless in this situation. He points out that he could and should have spoken to Sam Hackett (Luke Camilleri) after he returned home because he deserved to know the truth about his father so that there could at least he an attempt to move on. Oliver’s survival gave him hope and he embarked on a futile quest to find his father on the slim chance that he survived as well. In many ways this is a defining event in Sam’s life just as it was Oliver’s but the key difference here is that there was no measurable support system for Sam so he simply descended further into his own insanity. This isn’t entirely Oliver’s fault as he didn’t make the choice to shoot Sam’s father in order to ensure his own survival but he shares a measure of the responsibility for not following up on that upon his return from Lian Yu. Oliver admits that he made a massive mistake out of fear of being judged for the actions of his father. Sam’s feelings really didn’t enter into his thought process so in part this situation resulted from Oliver’s prior selfishness. As I repeatedly say, flawed characters are more interesting so it’s what he does to try and make up for his mistake that enhances him as a character. He openly admits to Sam that he lied about the situation on the raft and regrets it because it robbed him of the opportunity to gain closure and move on with his life. In effect Oliver’s decision created this situation and there’s nothing he can do but own up to it. It may be a short villain story but it’s possible to empathise with Sam considering the circumstances. His reaction is definitely extreme but it’s easy to see how he would be driven insane by not knowing if his father was alive for a long time and hearing Oliver lie on television about the occupants of the life raft must not have been an easy thing to deal with. The episode could have done more with this character but at least what was featured was very strong. Sam as an antagonist ties into the theme of legacy associated with this part of the season. Robert Queen wronged Sam by killing his father in favour of Oliver and he also wronged Emiko by abandoning her as well as her mother. Oliver clearly wants to make things right but at the start of the episode Emiko isn’t prepared to hear it as she considers Oliver to be part of the problem even if she doesn’t really know him. All she sees is the privilege that he enjoyed and she was denied so she is unable to think seriously about forming a relationship with her brother. Seeing how he deals with the Sam situation and setting the record straight on TV changes her mind to the point that she’s willing to think about talking. It’s not a huge step forward but there is at least some progress. Running alongside this was a Felicity and Evil Laurel plot that was engaging and added greater depth to Evil Laurel; not enough for me to consider referring to her as anything else but Evil Laurel but I’ll consider thinking about it. She is confronted by a figure from her past in the form of the first man she ever killed after getting her powers. There has been prior mention here and there about Earth-2 Quentin’s death being the catalyst for her decent into villainy and this episode looks to flesh out that element of her backstory by providing detail. Did anyone ever think they’d see the day? The gist of it is that Quentin was forced off the road on Evil Laurel’s thirteenth birthday after she threw a tantrum about him forgetting her cake. Teen Evil Laurel’s attitude was a consequence of Quentin being a workaholic who was never around so she had an unrealistic desire for her birthday celebration to be perfect. This comes with the usual trappings of the last thing she said to her father being “I hate you” which is frustratingly derivative as a motivating factor but Katie Cassidy Rodgers -congratulations on her recent marriage– manages to sell the material really well. She is clearly deeply affected by this regrettable moment in her life and the act of passion that resulted in her first kill as a result of how distraught she was makes a lot of sense. Felicity even points out that she isn’t as reluctant to talk about the vast number of others she killed which shows that the experiences that have led to the better version of her that now exists have intensified her regrets. There’s also an element of the first kill being the hardest to deal with and everything getting easier after that. It’s a complex story when any analysis is applied to it and shows that everything has a history if you’re willing to look far enough into it. It also allows her to gain closure as Felicity is the closest thing she has to a friend and is able to tell her that what happened to her Quentin wasn’t her fault. Evil Laurel’s concern about this ghost from her past is just that; she has no idea how he could be alive or on this Earth. She received threatening notes from what she assumes to be this man and seeks Felicity’s help in tracking him down. Bizarrely Felicity leaps right to the conclusion that he’s from Earth-2 because Evil Laurel says so and doesn’t consider the more likely scenario that he’s from Earth-1 and this is all an awkward coincidence. It’s somewhat convenient that Evil Laurel would be confronted by a drunk in a bar who so happens to be the counterpart of the first man she killed and who happens to say an ambiguous enough phrase to make her feel apprehensive. A contrivance like that is somewhat forgivable when it leads to such strong material. I must admit to being surprised that Evil Laurel and Felicity are now meeting for drinks though it’s fun that Evil Laurel is surprised by this too. She’s struggling to accept the fact that she is building a positive life on Earth-1 and that Felicity appears to consider her a friend. Upon arrival at the bar she pointed out that she assumed Felicity needed help torturing someone or something equally horrible. The transition to this point has been gradual enough that it feels wholly earned and is bolstered by Oliver’s admission that he “almost” likes Evil Laurel. She is gradually becoming part of their lives which is beyond what anyone expected. 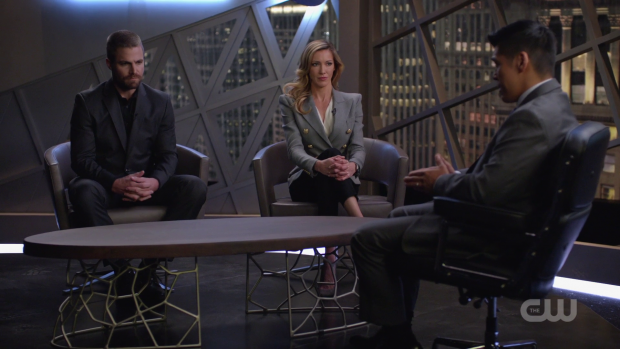 Further to that it’s always a joy to watch Felicity, Dinah and Evil Laurel work together on a case. The three characters bounce off each other so well and I’d like to see an entire episode carried by the three of them getting to the bottom of a particular mystery. The fact that they were barking up the wrong tree as to the identity of Evil Laurel’s stalker as indicated by the threatening note left for Dinah after his arrest will hopefully result in more plots involving the three of them working together. As I feared the A.R.G.U.S. storyline featuring Diaz is less than engaging. 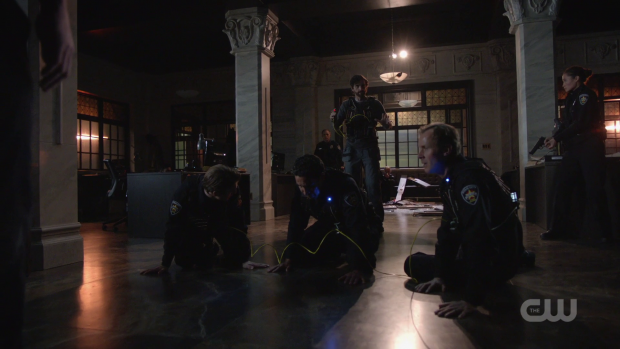 This episode deals with the formation of the Ghost Initiative or the legally distinct Suicide Squad which consists of China White, Joe Wilson, Carrie Cutter and Diaz. In some cases this is a pretty deep dive into the Arrow back catalogue at least where China White is concerned but it’s unclear where this is going if anywhere. The interviews near the beginning of the episode were clearly supposed to be edgy and witty but it didn’t quite land and the reveal that Diaz was set up by a virtual reality simulation detailing his escape so that he would lead them to the elusive Dante was less than impactful mostly because Curtis was apparently killed with no fanfare therefore telegraphing the fact that none of it was real. His absence in the future plot suggests that he doesn’t live until that point in time but I doubt he would be killed off so casually. Curtis’ reaction to the situation was really good though. His conversation with Diggle makes for a massive step forward for a character that has been largely languishing for a while. The realisation that A.R.G.U.S. needs his skills more than he needs them is played really well and allows Curtis to take control of his story to a large extent. In short he will still work for the organisation but will choose his own assignments which I guess makes him a self employed contractor rather than an employee with no voice. It creates tension between Curtis and the Lyla/Diggle pairing that could result in this corner of the show becoming more interesting despite feeling somewhat divorced from everything else that’s going on. A strong episode that deals with legacy, motivation and accountability in well thought out, character driven ways. Sam makes for a great if slightly underdone antagonist that is possible to feel sympathetic towards as Oliver’s oversight in not giving him closure on his father. It’s a mistake Oliver made on his own connected to one of Robert’s actions. His failure to deal with it because he was only looking out for himself makes for great characterisation and his conversation with Sam where he takes responsibility for it works wonderfully. Tying this into his tenuous connection with Emiko who sees his efforts as a positive step forward and considers talking to him as a result was a really nice touch as well. Evil Laurel dealing with a ghost form her past in the form of the first man she killed is a great way to add depth to her character. The backstory of Earth-2 Quentin’s death is somewhat contrived but Katie Cassidy Rodgers is entirely able to sell the material and make it work. The background implication that the first kill is something that never really leaves even if subsequent ones are easier to deal with and the idea that she has grown to the point of feeling that sort of remorse is encouraging. Her friendship with Felicity is a lot of fun as is any partnership that involves Evil Laurel, Dinah and Felicity working together. The A.R.G.U.S. plot is less than engaging at this point and the Ghost Initiative doesn’t really seem to be going anywhere. The virtual reality situation to trick Diaz into leading them to Dante was less than impactful because of the casual murder of Curtis. One good thing did come of this with Curtis realising that he is needed more than he needs them so takes control of what he will get involved in. It could add necessary tension to a plot that fails to feel connected to the overall story.